BlackBerry, which pioneered on-your-hip email with its first smartphones and email pagers, on Monday said it had set up a committee to review its options and that top shareholder Prem Watsa was stepping down from its board due to a possible conflict of interest. BlackBerry, once a stock market darling, has bled market share to the likes of Apple Inc and phones using Google Inc’s Android operating system, and its new BlackBerry 10 smartphones have failed to gain traction with consumers. BlackBerry shares were up 5 percent at C$10.57 percent near midday on the Toronto Stock Exchange but remained well below the levels seen in June, before the company reported dismal results that included poor sales of the BlackBerry 10 phones it views as key to a successful turnaround. Analysts expressed skepticism about the new committee, noting that Blackberry announced similar steps more than a year ago when it hired JPMorgan and RBC as financial advisers. As well as the smartphones that bear its name, BlackBerry has a valuable collection of patents, a well-regarded service business that powers its security-focused messaging system, and cash and investments of C$3.1 billion as of late June. The company is debt-free. BlackBerry’s fate is likely to prompt questions from the Canadian government, which vets foreign takeovers of Canadian firms. In the past the government has described BlackBerry as a Canadian crown jewel. The government said on Monday it would not comment on speculation about the company. Reuters last week quoted sources familiar with the situation as saying BlackBerry was warming to the idea of going private to give itself breathing room to recover. One source said the company has talked with private equity firm Silver Lake Partners about potential collaboration in enterprise computing. Legal experts say any deal taking BlackBerry private would work best if it had Canadian involvement, given Ottawa’s reviews of big takeovers for competitive and national security reasons. Watsa’s Fairfax Financial Holdings Ltd is BlackBerry’s largest shareholder, with a stake of about 10 percent. Watsa said Fairfax has “no current intention” to sell its Blackberry shares. “I continue to be a strong supporter of the company, the board and management as they move forward during this process,” he said. 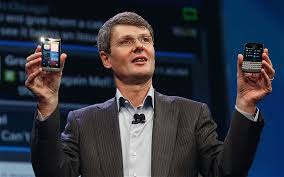 BlackBerry said board member Timothy Dattels, a former investment banker and Goldman Sachs executive, will chair the new committee, which will also include BlackBerry Chief Executive Thorsten Heins. A senior executive at a large Canadian pension fund that has worked closely with private equity players said on Friday that any prudent Canadian pension fund would take a look at BlackBerry or consider partnering in a private equity deal. “We would look at something like this and decide on its merits,” the executive said. “If private equity can buy Dell, they can buy anything,” the executive added, referring to efforts by Silver Lake and Dell Inc founder Michael Dell to buy the computer maker. Dattels is a senior partner at private equity firm TPG Capital and a former top investment banker at Goldman Sachs. His appointment to BlackBerry’s board in June last year sparked a flurry of speculation that the company might consider a leveraged buyout or going private. In addition to Dattels and Heins, the new committee will include Barbara Stymiest, Richard Lynch and Bert Nordberg. Stymiest, chair of BlackBerry’s board since co-chairs Jim Balsillie and Mike Lazaridis stepped down early last year, was formerly a top executive with Royal Bank of Canada. Lynch, who joined the board earlier this year, was formerly a top executive at Verizon Communications Inc. Nordberg, also on the board since earlier this year, was formerly a senior executive with Sony Ericsson. BlackBerry’s new line of devices hit store shelves this year just as the high-end smartphone segment was showing signs of saturation. Samsung Electronics Co Ltd recently reported results that fell shy of expectations, while Apple earlier this year reported its first quarterly profit decline in more than a decade.